The good: Low price; sturdy construction; attractive matte-finish display; fingerprint reader; long warranty. The bad: Keyboard could be bigger; weak speakers; smallish touch pad; merely average performance and battery life. The bottom line: Though larger businesses might be willing to pay for a richer feature set, the Toshiba Tecra A8 is an affordable, basic laptop for individuals and small-business users. With very similar components, the Toshiba Tecra A8 and M7 perform quite similarly. The M7's slightly higher battery capacity accounts for slight battery life differences between the two in MobileMark05 tests. Based on our test results, the Tecra M7 Tablet PC has a better display by far than the A8. The Tablet PC is fairly easy to use in either tablet or laptop configuration, and switching between the two is very simple. The A8 and M7 live up to the Tecra name from a construction point of view, both featuring good quality and sturdiness. The Tecra M7 is more expensive than the A8, but when you consider the additional functionality and display quality of the M7, it may well be worth spending extra dollars on Toshiba's M7 Tablet PC. When looking at computers, and notebooks particularly, my mind immediately, habitually begins processing two distinct bits of information: price and configuration. 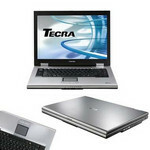 Upon receiving the A8 and looking at the online prices, those two pieces of information resulted in the almost reflex conclusion that the Tecra A8 is a stellar deal: a full-featured notebook, with XP Pro installed, a fingerprint reader, Trusted Platform Module (TPM) hardware-based encryption, and a pointing stick, all for somewhere between $900 and $1250 or so, depending on the exact configuration. (Personally, I wouldn’t be interested in the Celeron M model, though it may make sense for some people.) If you can live without a DVD burner, one of the lower-priced machines makes a lot of sense, but even if you do opt for the deluxe optical drive, the price is excellent, given all of the above. 75% Affordable, business-minded laptop has a poorly designed keyboard. A frustrating keyboard mars the Toshiba Tecra A8-S8314, a budget business laptop with an otherwise good design. Dubbed "the hallmark of quality" on Toshiba's Web site, this 6.3-pound unit is indeed a good performer and competitively priced. 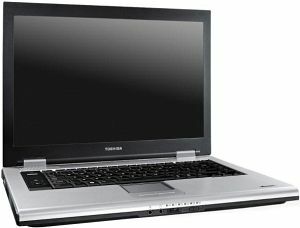 Our $1350 (as of 11/6/06) review unit included a 1.83-GHz Core Duo T2400 processor, 1GB of RAM, a 15.4-inch wide-aspect screen, a 100GB hard drive, a double-layer DVD burner, an SD Card reader, a FireWire port, three USB ports, integrated video memory, a fingerprint reader, and Microsoft Works 8.5. 60% Toshiba is all business with its latest durable, secure, dual-core workhorse. Sometimes looks are not deceiving: With rounded corners and a titanium, silver-and-black body, the Toshiba Tecra A8-S8314’s solid, business like design is true to the no-frills workhorse inside. Toshiba safeguards against bumps and falls by including protection for the motherboard, a protective display cover, a 3D accelerometer, and a reinforced, spill-resistant keyboard. At 6.2 pounds and about an inch thick, the A8-S8314 is well suited for performing office tasks or watching a DVD. The 15.4-inch widescreen LCD has good viewing angles between about 65 and 110 degrees. Within that range, the screen is crisp and sharp during multitasking and multimedia play. Whether you should get this notebook or not depends entirely on what you want to use it for. If you want mobility, then this isn’t the PC for you. If you want a games machine or a temporary replacement for your hi-fi speakers, then this isn’t it either. If all you need is a reliable machine for work and multimedia (and don’t mind too much bass in your music or don’t mind using headphones), then this machine is the one to check out. It’s got just the right features and functions, besides security, reliability, an excellent heat dispersion system and a nice wide screen. All of this for less than RM7,000 is quite a good deal, in my opinion. 420: » Further information can be found in our Comparison of Mobile Processsors. 68.5%: This rating is bad. Most notebooks are better rated. This is not a recommendation for purchase.